Reading this book caused quite a stir in my little cottage. The possums in the ceiling congregated en masse above my headspace, peered down dim lit cracks wondering what had caught my attention, what was feeding my…calm. 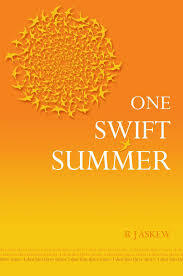 An epoch between late night literary obsessions, R.J. Askew’s One Swift Summer seemed to steal my life in real time, a perfect distraction. Pulled by his ‘creator’s strings‘, R.J is an author handed a pass to lucidity, poetry pure and like our hero Leonardo, he seems to ‘know more about you than you do?’ – reading the reader, the sweetest manipulator. But not in a derogatory sense. How can you feel contempt for an author who leads you, who caresses, who shakes you up – true gift, strike that, reverse it. The poetry between prose – for fear of reciting back the whole book – is breathtaking. Where other readers may find it distracting, these poetic interludes, randomly invading chapters is what I craved the most, soaring and insightful, eyes pricked waiting – rimmed from another place. The evocative backdrop set in Kew Gardens conjured for me images of Voltaire’s Dialogue Between Philosopher & Nature but I can be guilty of reading too much into things. It’s grounds, nooks and crannies lends itself beautifully to expose the prose. It’s ice cream, creperies, gift shops, tourists, Monkey Puzzles and swifts is simply a real and sensual background to draw on the characters of Emma Saywell, who has ‘smelt the death, full mental survival instincts’ of her lens’ subjects as a war photographer, Luigi the Milanese wannabe lothario, lovers Billy and Isabelle, and my favourite of favourite’s, the acerbic, venom spitting, verbal volleying Parker – their tongue duals a delicious voyeuristic encounter – en garde. There are other catalysts, liaisons and interactions all leading Leonardo onwards. His life is a poem, attempting to understand his purpose, how he got to where he is, acquiring an acceptance of it and the big, silent unanswerables. Painting such a positive image of this tome is only possible because a darkness lurks, but that is the dichotomy and one cannot exist without the other. Playful play on words, philosophical meanderings, this book never leaves it’s centre. I smirked and giggled, I cried tears happy and sad, R.J. Askew tapped me on the shoulder and stimulated my ‘minds eye green‘ and I’m in awe of his gift. Reblogged this on abbie foxton.